The Lake Worth Casino in West Palm Beach, Florida is Just the Ideal Place For Your Wedding! Lake Worth Casino is Your Dream Wedding Venue! Plan with Aaron’s Catering of the Palm Beaches. Lake Worth Casino Catering by Aaron’s is the perfect way to bring a beachfront, elegant wedding experience to you and your guests by hosting your event at Lake Worth Casino ballroom. Aaron’s can help to not only provide delicious dining and drinking options to your guests, but also to help simplify many of the details of Lake Worth Casino catering plans. Important considerations for wedding or other special event planning include the kitchen preparedness, professional serving staff and bar tenders, and dining room setup. Good catering companies will offer you options for entertainment, audio/visual, lighting and floral decor in order to bring aesthetic agreement to the environment as a whole. Aaron’s Catering offers all of the above in addition to outstanding cuisine and a variety of menus. International options are available and recommended, from Italian to Tapas, Sushi to South American. Due to a wonderful location on the beach between two major cities in Florida, Lake Worth is the perfect destination for special events. What is even more special about the Lake Worth Casino, however, is the blend of classic beachfront paradise, sophisticated ballroom, and modern, newly renovated interior. Plus, Catering in Lake Worth for weddings, corporate events, charity galas or any other special day is more enjoyable than ever now that Aaron’s Catering of The Palm Beaches can take care of all of the aspects of event planning and menu design. In a city built by romance, Lake Worth Casino is in Lake Worth, Florida. Originally settled in 1883, the town fronts both the Intracoastal Waterway and the Atlantic Ocean. The town sits just south of Palm Beach, West Palm Beach and about 60 miles north of Miami, making travel easy from multiple airports and nighttime getaways possible for locals. For extended travel times (think wedding planning), the downtown district is a South Florida tourist destination, ripe with restaurants, history and art. The largest freestanding cross in Florida is in Lake Worth at the Epiphany Lutheran Church. The Municipal Beach hosts one of the largest open, public spaces and longest public pier on the ocean in Eastern Florida. Golf, hiking trails, and camping areas are all available for public use in addition to bountiful beach recreation including marinas, fishing, and water sports. Spot dolphins, manatees, and tropical birds from the beach or the water where you may find yourself surrounded tropical plants, making the motto Where the Tropics Begin just about right. Take a deep breath, close your eyes, and complete your perfect Lake Worth wedding: imagine walking across the sand on a tropical Florida beach to say the two most important words of your life, before moving inside to an historic ballroom and flawlessly chosen menu. We know there are a hundred things to work on before the special day, so Aaron’s Catering has teamed up with Lake Worth Casino to make this process as stress-free as possible for the bride and groom. Aaron’s Catering has many wedding menus, for you to view and try for free in a complimentary tasting during your planning stages. Our catering specialists have put together ideal menu designs, taking guests on a journey from hors d’oeuvres to dessert. Our skilled and trained staff can serve your selections as plated or buffet, depending on your preferences. Your choices don’t stop with the menus. Aaron’s Catering offers floral arrangements, decor, audio/visual, lighting, entertainment, and more. The Lake Worth Casino is the ideal beachfront location for a Lake Worth Wedding. A classic ballroom and state-of-the-art kitchen offer elegance integrated with a modern palate that we can enhance together to suit your tastes and wedding guests. 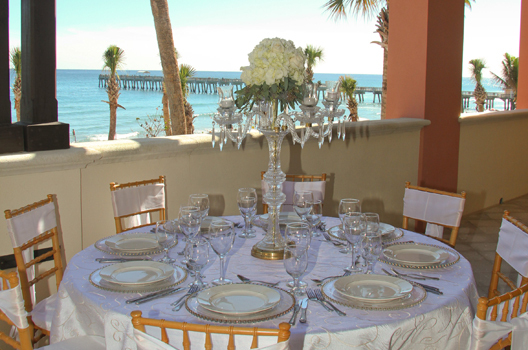 The ballroom view from elegant French doors and balconies falls upon the beach by the Atlantic Ocean, Intracoastal Waterway, and the famous Lake Worth pier. Weddings can be performed inside of the ballroom or outside on the beach just north of the pier.Specialty Caterers for Weddings in Lake Worth Are you hoping for a romantic getaway Lake Worth wedding with a fully-inclusive caterer? The ultimate package is not far from your reach. The team of catering specialists at Aaron’s Catering creates unforgettable special occasions in the West Palm Beach area and across South Florida. Our catering team is now working with Lake Worth Casino to offer wedding parties at gorgeous, oceanside ballroom ceremony and reception to make the event meet your highest expectations. Aaron’s Catering offers complete menu packages as Lake Worth wedding caterers that can be customized to your tastes and special menu needs. We offer a selection of fine dining hors d’oeuvres, plated or buffet appetizers, themed cocktail stations, four delicate salad options, and premiere plated or buffet entrees. Consider a South Florida seaside menu option with a full clambake or an elegant raw bar. And, of course, an event isn’t special without dessert. From cheesecake to tiramisu, key lime mousse cake to gourmet pastries, all of your dessert needs can be met. Stunning custom designed fondant wedding and celebration cakes can be made to meet your specifications as well. Aaron’s Catering options are just about unlimited. Services offered include assistance with a full, customizable wedding menu, skilled service and bar staff, floral arrangements, decor, entertainment, and more. Our team can also help you to streamline the process by working with you to host the engagement party, bridal shower, and rehearsal dinner. Fill out the form to the left for your personal consultation with complimentary tasting and wedding photo viewing. Our specialists and caterers are ready to create your Lake Worth wedding experience of a lifetime.